Did you know? 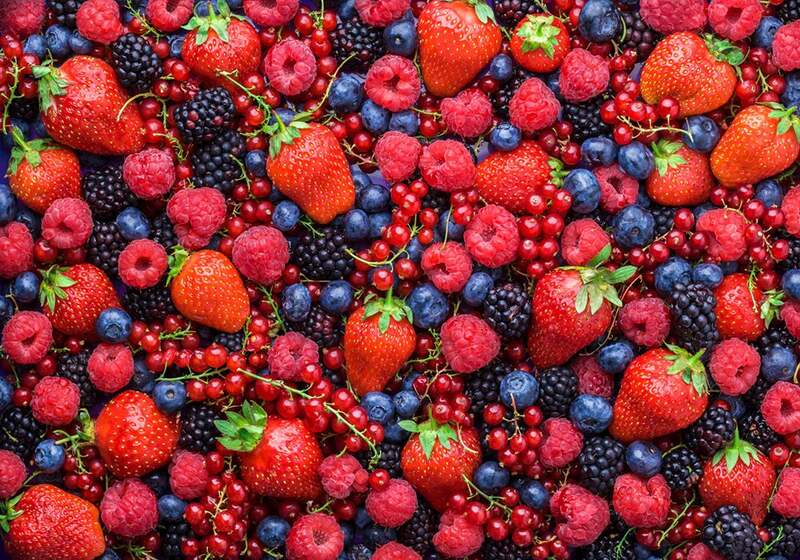 Berries boast many beneficial features like carrying antioxidants, which are full of vitamins A, C, and E. This means that berries contain elements that protect cells from damage and possibly disease. These elements also help to lower inflammation and work protectively against various illnesses. There are so many kinds and what I love most about berries is that they grow quickly, for example, raspberries need only days of sun to go from zero to bright red and sweet. Raspberries are also easy to find in pretty much any rural area. Depending on the kind, they are in season from the beginning of summer into mid-fall. And there are so many ways in which you can preserve them for off-season months. In this case, they obviously don’t preserve all the nutrients, but they bring summer taste into the later months. Frozen berries work perfectly in infusion waters and can be served instead of ice. You could also fill them with chocolate bites and freeze for instances when you feel like you’re running low on sugar and cannot go without chocolate. Choose a sweetener that will thicken the berries well, add some lemon, a splash of water if needed. Cook on low heat for as long as the berries need to break up a little. Let them out in the summer sun until they are totally dehydrated and store for later to use in trail mixes, in compotes or by themselves. Cook some millet and mix in one quart the amount of carob flour. You could additionally add any sweetener of your preference, cocoa or cinnamon or other sweet spices, but most of the time I prefer not to, as carob flour is sweet enough. Cool and serve topped with a mixture of cottage cheese and berries, my favorite topping is raspberries. Berries work preventively, lowering the risks of some diseases linked to the heart and even cancer, due to anti-inflammatory properties. 1. They contain high amounts of antioxidants. 2. They are rich in resveratrol which can be also found in red wine and dark chocolate and it helps lower inflammation and prevents against clogged arteries. 3. They are full of flavonoids which give berries their vibrant colors and equally vibrantly boost our system. They work preventively against illness. They also go well with any meal of the day. Paired with oats, nuts or yogurt in the morning. On a piece of bread as a jam, in a trail mix or by themselves for a snack. And as a side to lunch and dinner. I find them great with salads or salad wraps or incorporated into deserts. Even though they are one of the smallest, they are one of the healthiest fruits. Plus, I find their vibrant colors inspirational for my daily looks, which is always a bonus, right?